SpecificityThe Human Galectin 3 ELISA Kit allows for the detection and quantification of endogenous levels of natural and/or recombinant Human Galectin 3 proteins within the range of 156 pg/ml - 10000 pg/ml. 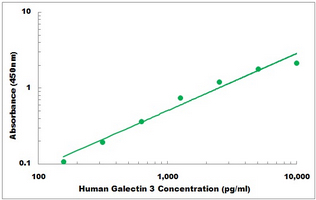 SensitivityThe minimum detectable dose of Human Galectin 3 is typically less than 10 pg/ml. Intended UseHuman LGALS3 ELISA Kit allows for the in vitro quantitative determination of LGALS3 , concentrations in serum, Plasma , tissue homogenates and Cell culture supernates and Other biological fluids. specificalPrinciple of the assay: The Human Galectin 3 ELISA (Enzyme-Linked Immunosorbent Assay) kit is an in vitro enzyme-linked immunosorbent assay for the quantitative measurement of Human Galectin 3 in Cell Culture Supernatants, Serum, Plasma. This assay employs an antibody specific for Human Galectin 3 coated on a 96-well plate. Standards and samples are pipetted into the wells and Galectin 3 present in a sample is bound to the wells by the immobilized antibody. The wells are washed and biotinylated anti-Human Galectin 3 antibody is added. After washing away unbound biotinylated antibody, HRP-conjugated streptavidin is pipetted to the wells. The wells are again washed, a TMB substrate solution is added to the wells and color develops in proportion to the amount of Galectin 3 bound. The Stop Solution changes the color from blue to yellow, and the intensity of the color is measured at 450 nm. Background: Galectin-3 (GAL3), also known as LGALS3, MAC2 or GALBP, is a member of the lectin family, of which 14 mammalian galectins have been identified. Galectin-3 is encoded by a single gene, LGALS3, located on chromosome 14, locus q21-q22. It is expressed in the nucleus, cytoplasm,mitochondrion, cell surface, and extracellular space. Studies have also shown that the expression of galectin-3 is implicated in a variety of processes associated with heart failure, including myofibroblast proliferation, fibrogenesis, tissue repair, inflammation, and Ventricular remodeling. Galectin-3 is expressed in various tissues and organs, but is significantly absent in normal hepatocytes. Inquiry About Human LGALS3 ELISA Kit If you hope to order it or contact us directly, please contact us via sales@biobool.com. We will get back to you in 12hrs,Thanks!